Anyway! Thanks to the interwebs I discovered tinctures. They're pretty easy to make yourself too, so I figured I'd try some of Wellness Mama's recipes. Making your own recipes guarantees there's no weird ingredient snuck in and once you have these kind of ingredients in bulk lying around, it becomes more affordable too. For this endeavor I made the digestion tincture and the chamomile tincture. Pour boiling water over the peppermint, ginger, and fennel in a glass jar. Random tip, keep your ginger root frozen... it makes it a lot easier to grate and keeps it fresh! Fill the jar with the vodka or rum. Store in a cool, dark place for 2-6 weeks. I did four weeks, just setting a Google reminder when I needed to finish it. Shake it every day in the meantime to help everything meld together. 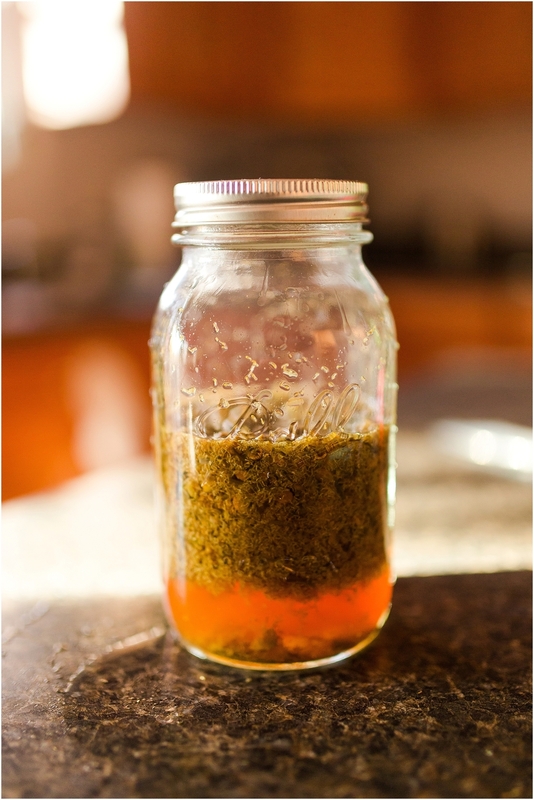 After 2-6 weeks, strain and store the liquid in glass jars. I got these dropper bottles on Amazon. I had no idea how many to buy, but 12 turned out to be the perfect number since each of these recipes gave me about 6 1 oz jars full. Pour boiling water over the chamomile and then fill the jar with the alcohol. Follow the same directions as the digestion tincture... storing in a cool, dry place for 2-6 weeks, shaking daily. Do you have any favorite tincture recipes that I should try out??? I'd love your feedback!